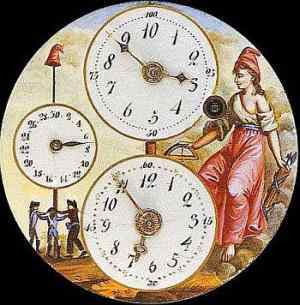 This is a French clock from 1800 with the old 12-hour system as well as the new revolutionary system of metric time. Unlike the meter, decimal time never made it out of the Revolution. To my knowledge, the new time measurement made absolutely no inroads in Naples in spite of the presence for nine years of the French under King Murat during that period. (Metric time didn't fare much better in France, either.) That's fine with me; imagine referring to the film High Noon as High Five. Here are some other units of measure from the old Neapolitan system. The list is not exhaustive and ignores the changes in unit value from time to time and the fact that the same term might have variations depending on how and where it was used (in the same way as the English system speaks of “statute mile” and “nautical mile” or “US gallon” and “imperial gallon”). acino: a measure of weight = about 0.45 grams (or 0.016 ounces). The word, itself, means a single “grape”; thus, it was used for light weights. botte: A maritime unit for tonnage of vessels. It was based on the botte, a wine container. Roughly, one botte = about 500 liters; it contained 12 barili (see above). For purposes of measuring wine or vegetable oil, two botti (i.e. 1000 liters) made up one carro (wagon). One botte was subdivided into the salma and the staio in the same way as English measurement still speaks of gallons being divided into quarts and pints. One salma was ca. 160 liters and, itself, was subdivided into 16 staia. 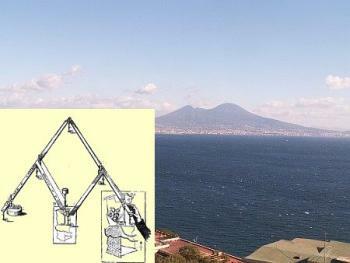 braccio (arm): Unit of linear measurement = about half a meter. There was also a longer maritime braccio equal to ca. 1.6 meters. miglio (mile): a Neapolitan mile was 1,000 paces; that is, 7000 palms or about 1850 meters (ca. 6,070 feet, curiously close to the English nautical mile of 6,076 feet). lega (league): not common in Naples, but if found it probably referred to the Spanish unit (legua)= ca. 2.6 miles. The unit was abolished in the Spanish empire (which Naples was part of) in 1568.
canna: The standard unit of linear measurement in commerce (measuring textiles, for example) and construction. It was just over 2 meters and was divided into 8 palmi (see above). cantaro: Unit of heavier weight common in maritime usage = about 90 kilograms (almost 200 pounds). It was divided into rotoli (plural of rotolo, see below). libbra and oncia (pound and ounce): Units of weight. There were 12 ounces in the pound. The subdivision of the ounce was the trappeso. passo: The pace. A unit of linear measurement = about 7 “palms” (above); i.e., just under 2 meters. There was an older maritime passo, somewhat smaller. piede: Foot. Approx. one English foot or 1/3 of a meter. rotolo: Unit of weight, somewhat lighter than 1 kilogram or a bit more than 2 pounds. tomolo: A unit of measure for dry volume such as grain = ca. 55 liters (about one and one-half bushels). trappeso: The smallest unit of weight in the old Neapolitan system and defined as the 1/1000 part of a rotolo or 1/20 of the acino. Finally, if “I love you a bushel and a peck…,” how much do I love you in cubic furlongs?